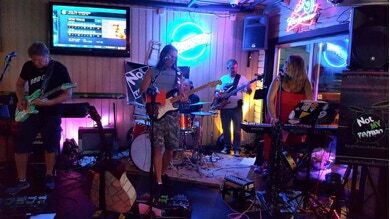 Gig-wise I performed fill-in roles in the North Of Fifty Band playing in Enumclaw (City Hall Saloon) and last night Aug 10th at Billy McHales pub in Federal Way. Both gigs were fun (as always) and of course pretty challenging as I had to learn a bunch of new tunes like : Dreams, Rhiannon, Somebody To Love, Runaway as well as re-learn old tunes like Smoking Gun, Walk Of Life, Rocket Man, Whitershade Of Pale etc. In all I would say I put in around 15-20 hours to prepare for these gigs. 1. I was still getting some-buzzing from my Status bass when I played it at Church gigs, which I strongly suspect has to do with bad grounding. None the less I ordered new pick-ups from Status UK ($200 USD) to see if that improves things - and it certainly has….well that and using my wireless system. 3. I’ve also finally purchased an iPad Pro (my first iPad ever) and are really enjoying it. I especially like the BandHelper app. (see picture 1) that I have now used on two North Of Fifty gigs (and tonight will be my 3rd live use of it) to keep all of my song notes. This software allows you to create songs in the cloud, associate MP3’s, chords, chord charts, even store MIDI messages, tempo counts etc and then access it all from your iPAD in the form of SetLists for live performance. So far so good - you might hear more about this app. in future blogs as I learn more. Also enjoying having an iPad on the cell network so I can look up chord charts at the last minute at gigs. Thats about it…I might add some comments after tonight gig.